Dan Atherton makes the entire MTB race world reconsider their profession. When the best mountain bikers on the planet crash out or decide to drop out of a downhill event, there has to be something significantly sketchy about it. Thanks to MTB pusher of limits, Dan Atherton, Red Bull Hardline is significantly sketchy. Returning to the Dyfi hills of North Wales for the fourth time, Hardline is a downhill race that features invited riders, chosen by the likes of the Athertons, Red Bull and even hustlers like Sven Martin, who got a stoked Bruce Klein an entry into the show. I was at Interbike, trolling the halls and saw Bruce cruising by at a quick clip. Ready to start a conversation, I said "Hey Bruce." His fast walk turned into a jog and I figured he was trying to run thinking a team rumor question was coming. He yelled back, "I JUST GOT INVITED TO HARDLINE, GOTTA GO!" Bruce went from doling out KHS demo bikes at Bootleg Canyon the day before to hopping on a plane to England to race the most savage downhill course on record. This is one of those positives of invite-only events. Bruce was seen blasting Hardline booters a day later in Vital RAW from Day 1 practice. 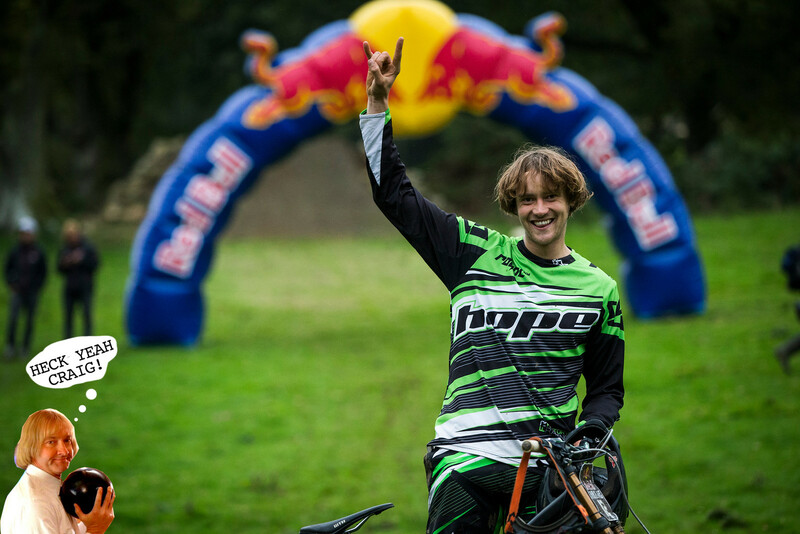 The riders invited to Hardline are primarily World Cup downhill racers, but Darren Berrecloth was on the list. Unfortunately, he got hurt early. Enduro and video-hijinx-man, Yoann Barelli showed up, too. Combine the rowdiness of the course with greasy, rain-soaked conditions and small windows of practice time, and he chose not to compete, saving himself for other feats of fortune on his two-wheeler. Sam Reynolds sampled some jumps in superman fashion but didn't try for the show. By race day, when the field of attempted qualifiers were narrowed down to ten finalists, downhill race specialists remained. A testament to Affy's twisted outlook on what a race course should be, the qualifiers agreed this was the most difficult run down a mountain they'd ever tried to race. Not even Rampage makes drop-outs and knock-outs of skilled riders like Hardline does. Gee Atherton? Charlie Hatton? Out because of crashes. Getting crashed out was almost more normal than finishing the day alive. There's something about rain mixed with bikes, immovable rocks, hucks to flat and aged trees that a crashing human body doesn't like - unless you're Adam Brayton. He crashed into a tree so hard in his run that he left a massive, permanent gash in its bark. Brayton didn't even notice, hopped back on his bike and finished his run. The tree was left there to weep. Listen to the rider interviews and drool (and cringe) over the nasty photos from Dan, Sven and Boris! Yes spomer, we appreciate your speech bubbles...please keep doing them. Great shot of Charlie coming over the crest! D-Mac whip shot over the stone wall is hot fyah. Interview with Evans is even better. Been waiting for that pic to surface. Sven was giggling like a mad man when he snapped it in the RAW video.